رزاقی کاشانی, مهدی, علیمردانی, محمد, قریشی, میر حمید رضا. (1395). مقایسه روش‌های صعود موئینگی و ‌قطره‌گذاری ثابت بر سطوح نامتخلخل در تعیین انرژی سطحی تقویت‌کننده‌های پودری مورد استفاده در کامپوزیت‌های پلیمری. نشریه علوم و مهندسی سطح, 12(27), 81-92. مهدی رزاقی کاشانی; محمد علیمردانی; میر حمید رضا قریشی. "مقایسه روش‌های صعود موئینگی و ‌قطره‌گذاری ثابت بر سطوح نامتخلخل در تعیین انرژی سطحی تقویت‌کننده‌های پودری مورد استفاده در کامپوزیت‌های پلیمری". 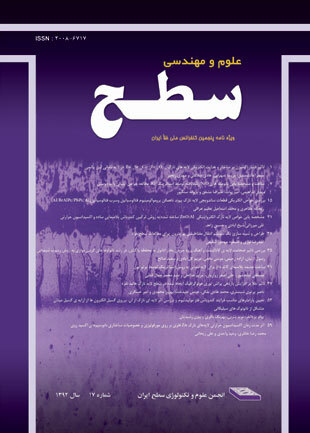 نشریه علوم و مهندسی سطح, 12, 27, 1395, 81-92. رزاقی کاشانی, مهدی, علیمردانی, محمد, قریشی, میر حمید رضا. (1395). 'مقایسه روش‌های صعود موئینگی و ‌قطره‌گذاری ثابت بر سطوح نامتخلخل در تعیین انرژی سطحی تقویت‌کننده‌های پودری مورد استفاده در کامپوزیت‌های پلیمری', نشریه علوم و مهندسی سطح, 12(27), pp. 81-92. رزاقی کاشانی, مهدی, علیمردانی, محمد, قریشی, میر حمید رضا. مقایسه روش‌های صعود موئینگی و ‌قطره‌گذاری ثابت بر سطوح نامتخلخل در تعیین انرژی سطحی تقویت‌کننده‌های پودری مورد استفاده در کامپوزیت‌های پلیمری. نشریه علوم و مهندسی سطح, 1395; 12(27): 81-92. این پژوهش روش‌های صعود موئینگی واشبرن و قطره‌گذاری ثابت بر سطوح صاف و فاقد تخلخل را به عنوان دو روش اصلی در اندازه‌گیری دقیق انرژی سطحی مواد پودری مورد ارزیابی و مقایسه قرار می‌دهد. از پودر سیلیکای اصلاح نشده و سه نوع اصلاح شده با عوامل جفت‌کننده‌ سیلانی استفاده و اثر ماهیت شیمیایی سیلان و همچنین طول زنجیره‌ آلیفاتیکی کوتاه (سه کربنه) و بلند (16 کربنه) سیلان بر انرژی سطحی این مواد بررسی می‌شود. بدنبال ارزیابی فرآیند اصلاح سطحی با طیف‌سنجی مادون قرمز، روشی نوین جهت تهیه قرص‌های غیر قابل نفوذ از مواد پودری با استفاده تلفیقی از پرس هیدرولیکی و پرس ایزواستاتیک سرد معرفی می‌‌گردد. استفاده از سیلان با طول زنجیر آلیفاتیکی بلند در مقایسه با سیلان کوتاه‌زنجیر می‌تواند با ایجاد یک سطح بسیار آبگریز انرژی سطح سیلیکا را به شکل معناداری تغییر دهد، به گونه‌ای که زاویه تماس آب که در مورد سیلیکای اصلاح‌شده با سیلان با طول زنجیر آلیفاتیکی سه کربنه 47 درجه مشاهده شده بود به 137درجه در مورد سیلان با زنجیر 16 کربنه تغییر یافت. در ادامه شرایط سطحی سیلیکا با استفاده از مقدار سیلان به سیلیکای مصرفی تغییر داده شد و پخش ذرات پرکننده در ماتریس پلیمری به عنوان نمونه‌ای از اهمیت اندازه‌گیری دقیق انرژی سطحی مورد کنترل قرار گرفت. B. Natarajan, Y. Li, H. Deng, L.C. Brinson, L.S. Schadler, Effect of interfacial energetics on dispersion and glass transition temperature in polymer nanocomposites, Macromolecules, 46 (2013) 2833-2841. M.-J. Wang, Effect of polymer-filler and filler-filler interactions on dynamic properties of filled vulcanizates, Rubber Chemistry and Technology, 71 (1998) 520-589. K.W. Stöckelhuber, A.S. Svistkov, A.G. Pelevin, G. Heinrich, Impact of Filler Surface Modification on Large Scale Mechanics of Styrene Butadiene/Silica Rubber Composites, Macromolecules, 44 (2011) 4366-4381. J. Shang, M. Flury, J.B. Harsh, R.L. Zollars, Comparison of different methods to measure contact angles of soil colloids, Colloid Interface Sci., 328 (2008) 299-307. W. Wu, R. Giese Jr, C.J. Van Oss, Change in surface properties of solids caused by grinding, Powder Technol., 86 (1996) 129-132.
containing superhydrophobic coatings on glass, Appl. Polym. Sci., 132 (2005) 1-8. M. Marini, F. Pilati, B. Pourabbas, Smooth Surface Polypyrrole‐Silica Core‐Shell Nanoparticles Preparation, Characterization and Properties, Macromol. Chem. Phys., 209 (2008) 1374-1380. B. Neirinck, D. Soccol, J. Fransaer, O.V.d. Biest, J. Vleugels, Influence of short chain organic acids and bases on the wetting properties and surface energy of submicrometer ceramic powders, Colloid Interface Sci., 348 (2010) 654-660. A. Siebold, A. Walliser, M. Nardin, M. Oppliger, J. Schultz, Capillary rise for thermodynamic characterization of solid particle surface, colloid and interface science, 186 (1997) 60-70. S. Kirdponpattara, M. Phisalaphong, B.-m.Z. Newby, Applicability of Washburn capillary rise for determining contact angles of powders/porous materials, Colloid Interface Sci., 397 (2013) 169-176. B. Neirinck, J. Van Deursen, O. Van der Biest, J. Vleugels, Wettability assessment of submicrometer alumina powder using a modified washburn method, Am. Ceram. Soc., 93 (2010) 2515-2518. Z. Jiang, L. Meng, Y. Huang, L. Liu, C. Lu, Influence of coupling agent chain lengths on interfacial performances of polyarylacetylene resin and silica glass composites, Appl. Surf. Sci., 253 (2007) 4338-4343. N. Yan, Y. Maham, J.H. Masliyah, M.R. Gray, A.E. Mather, Measurement of contact angles for fumed silica nanospheres using enthalpy of immersion data, Colloid Interface Sci., 228 (2000) 1-6. I.M. Grimsey, J.C. Feeley, P. York, Analysis of the surface energy of pharmaceutical powders by inverse gas chromatography, Pharm. Sci., 91 (2002) 571-583. J. Dove, G. Buckton, C. Doherty, A comparison of two contact angle measurement methods and inverse gas chromatography to assess the surface energies of theophylline and caffeine, Int. Pharm., 138 (1996) 199-206. M. Davies, A. Brindley, X. Chen, M. Marlow, S.W. Doughty, I. Shrubb, C.J. Roberts, Characterization of drug particle surface energetics and Young’s modulus by atomic force microscopy and inverse gas chromatography, Pharm. Res., 22 (2005) 1158-1166. C.I. Spătaru, V. Purcăr, D. Donescu, M. Ghiurea, O. Cinteză, T. Miclăuş, Preparation of Hydrophobic Surface Based on Hybrid Silica Films by Sol-Gel Process, Adv. Mater. (Weinheim, Ger. ), 5 (2005) 7-12. T. Dang-Vu, J. Hupka, Characterization of porous materials by capillary rise method, Physicochemical problems of mineral processing, 39 (2005) 47-65. B. Akhavan, K. Jarvis, P. Majewski, Tuning the hydrophobicity of plasma polymer coated silica particles, Powder Technol., 249 (2013) 403-411. M. Castellano, L. Conzatti, A. Turturro, G. Costa, G. Busca, Influence of the silane modifiers on the surface thermodynamic characteristics and dispersion of the silica into elastomer compounds, Physical Chemistry B, 111 (2007) 4495-4502. M. Abdelmouleh, S. Boufi, M. Belgacem, A. Duarte, A.B. Salah, A. Gandini, Modification of cellulosic fibres with functionalised silanes: development of surface properties, Adhesion and Adhesives, 24 (2004) 43-54. B. Mahltig, H. Böttcher, Modified silica sol coatings for water-repellent textiles, Sol-Gel Sci. Technol., 27 (2003) 43-52.